Sola Scriptura means = That Scripture alone is authoritative for the faith and practice of Christian. The Scriptures from the Bible is the final authority! Here are some encouraging scriptures to encourage you. Read The Encouraging Scriptures Of God! For Encouraging Scriptures Click Here! Biblical encouragement will help you in whatever situation you are in! The scriptures can be so very encouraging to you, but you need to make the time to read them. We have many encouraging scriptures that will give you hope and a better focus on the life you want to live. I have learned over the years since I first became a follower of Jesus Christ, that God’s word is alive and has the power to change the lives of those who believe. I think people often do not take the time to understand what the Bible is all about, each for their reason. My suggestion to you is that if you read the encouraging scriptures below slowly and purposefully, and you will realize what a treasure that God has given us. Tell me more about the Bible? What is the doctrine of the sufficiency of Scripture? We are confident that these encouraging scriptures will speak to you and your needs. Take a moment to ask God to allow His word to speak to you to make an impact on you! 1 Peter 5:7 Casting all your anxieties on him because he cares for you. Galatians 5:22 But the fruit of the Spirit is love, joy, peace, patience, kindness, goodness, faithfulness. 1 Corinthians 10:13 No temptation has overtaken you that is not common to man. God is faithful, and he will not let you be tempted beyond your ability, but with the temptation, he will also provide the way of escape, that you may be able to endure it. 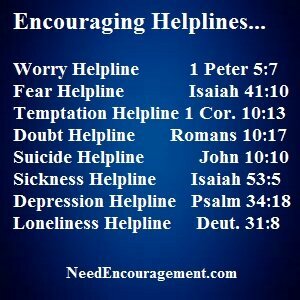 Five Encouraging Scriptures To Lift You Up! 1 Thessalonians 5:11 Therefore, encourage one another and build one another up, just as you are doing. Psalm 29:11 May the Lord give strength to his people! May the Lord bless his people with peace! Encouraging Scriptures And Beautiful Pictures!